DBAs running SQL Server on Linux will not only need to understand SQL Server security well, they will also need to understand how security works on Linux. In this article, Kellyn Pot'Vin-Gorman walks you through several examples, explaining the permissions and ownership of files and directories in Linux. As you jump into Part 3, you’ll begin to realize how involved your education will be with Linux, and how it is taking over the world. The previous articles just scratched the surface with your new Docker container with Linux and SQL Server. You have embraced how users are created in a Linux system and what a group is. You’ve begun to understand the power of the Linux kernel and the pure simplicity of it. This takes you to the next step in your education: ownership and permissions. Unlike Windows, there’s no registry layer when working with Linux. As an operating system, Linux expects that if you’ve been granted rights to perform a task, you should have the knowledge and skills to be trusted to perform the task. Every object in Linux is treated as a file, and permissions are at the core of this. Understanding how permissions work is essential, and this is the next step in your Linux journey. And empty files to work with ownership and permission assignments. Fill in the password, etc., for jsmith2 and retain the password for future logins. SU, (switch user) to jsmith2. 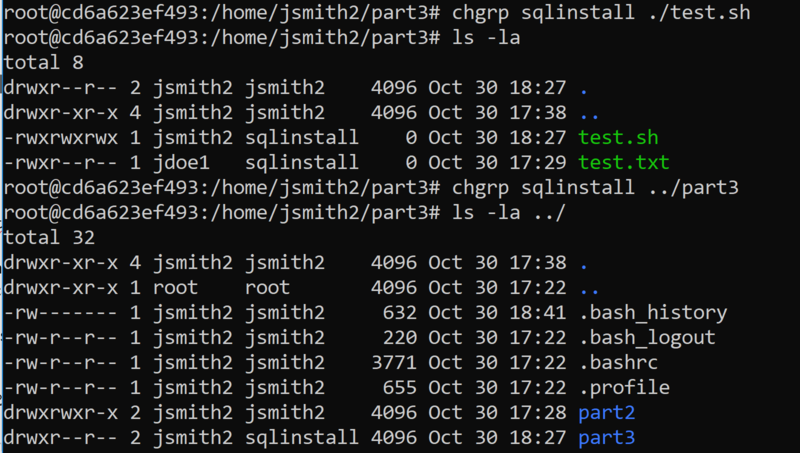 Now check with the pwd command again to verify that you’re in the /home/smith2 home directory. Each file will have three designations of ownership. One will be the owner; the second will be the group assignment, (which can also be assigned to the owner) and lastly, all others. The third designation isn’t an assignment, but the first two, owner and group, are. As root, (domain owner) you would be able to change the owner of any file or switch permissions. You can also do this as the user if they have SUDO, (Switch User to Domain Owner). As you’re currently logged in as jsmith2, exit out of the current shell from user jsmith2 back to root. The second choice, if you want to run everything with the SUDO command, is to grant SUDO to jsmith2 as ROOT. To do either, you must exit out of the current shell back to ROOT. Note that the prompt returns to displaying the root login at the very left. If you want to grant SUDO, it can be done with the following command. Recognize that jsmith2 now has root privileges on the host and, although his sudo executions can be audited, this user will now have these privileges. You can now change the owner and group of the files in the existing directory. 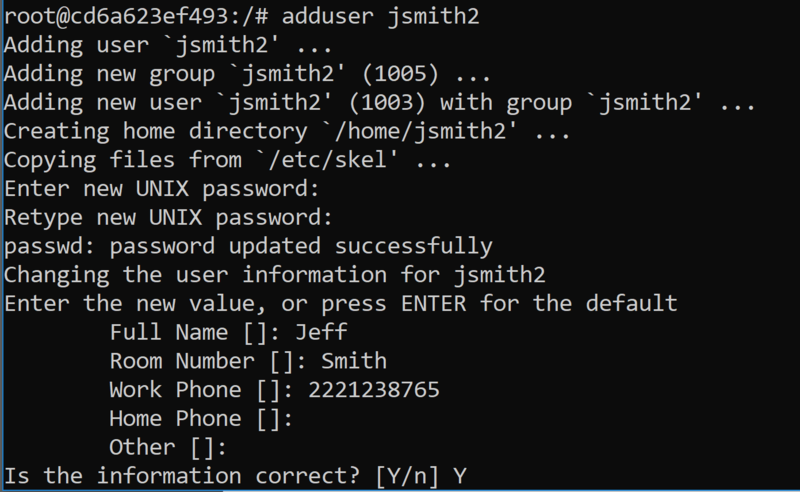 The example displayed below demonstrates what would be required if you weren’t root and using the SUDO command as jsmith2, but if you are logged in as root, the SUDO is left off the command. In this example, you’ll change the owner to jdoe1 and the group to sqlinstall. Note that the account and group were created in the last article. This is all there is to changing the ownership on a file, as well as the group in one command. Similar to Microsoft Windows, there are three main categories of ownership that can be assigned singularly or in combination to create the correct allocation of ownership to any file. There’s also a global grant to “ALL” that encompasses all categories as one. From here, permissions are granted to perform tasks. As with a database, the least required privilege(s) to perform the action should be considered. Although three simple grants are all that are available, in combination, they create the complexity required to secure the users internal to the OS. There are multiple modes to allocate permissions to files and directories. I’ll discuss the two main ones- numeric and alpha mode. In this mode, there is a numerical value that is assigned to each permission to simplify grants. Where this might sound confusing at first, when you see the values clearly displayed by grant, it begins to make sense. Other has no privileges to the file. If you typed this command in, you should receive the following error, but why? The file is no longer owned or even part of a group that jsmith2 is part of. You could switch back the ownership of the file, but for this exercise, you’ll understand the importance of ownership and create a new file to work with, this time calling it test.sh and changing the permissions on this new file. Unlike a standard ls, (list) command, a ls -la, (list all) command will display the permissions for the files contained in any directory broken down by owner, group, other and by individual grants. drwxr--r-- 2 jsmith2 jsmith2 4096 Oct 30 17:29 .
drwxr-xr-x 4 jsmith2 jsmith2 4096 Oct 30 17:38 ..
A “d” in the beginning columns signifies that this is a directory, vs. a file. Notice that there are ten fields that are populated by the output- one for type and nine for permissions to the three categories, owner/user, group and other. The owner has read, write and execute on the file, the group has read and write to the file and all others are only allowed read access. Understanding these privileges is essential to a DBA so you can manage the privileges to system and data files, subsequently securing your database server at the OS level. Now that you know how to change the owner and grant privileges on a file, it may be helpful to have a reminder on a few ways to create a file. Below are the most common ways users create a file, most often for write at the time or later. You may choose any of these methods, vi(m) being an older method, and nano, emacs and other editors being newer ones. Touch is most often used to verify write privileges to a location, as it efficiently creates an empty file in the directory and will fail if privileges are missing. The secondary mode for granting privileges is Alpha mode, which uses letters to identify the category of user and privilege. You will again work with your jsmith2 user and part3 directory from the home/jsmith2/part3 location. This method can be used to remove permissions as easily as grant them, simply executing the chmod command, a “-“, the alpha mode permission and the file or directory name to remove privileges to the owner. To assist in why you would want to remove privileges from yourself, a use case is a file or directory you want to protect yourself from an accidental write or execution of, you can change the permissions to help ensure this. This command ends with the name of the file, and when no user/group/category is added, it only addresses permissions for the user executing the chmod command. The next command adds execute to the owner, group and other category for file ownership. This would result in everyone being able to execute the shell script. At this point in the process, exit back out and become root to perform the next commands. The root user should be at the left of your prompt if you’re using the Docker image to work along with this article. This would remove jsmith2’s write privileges to the test.sh file. This might seem counter intuitive. Why would you wish to remove write privileges from your own file? Removing write or execute could protect from mistakes in processing or remind the user which script is the active one, while retaining historical code. Beyond chmod, is chgrp, (Change Group) which unlike chown, (change owner) that allows for a group allocation at the time of the command, can change the group with a separate command. Notice that you can change the group on a file or a directory, (remember, everything is treated as a file in Linux) as easily as I can change owner, permissions, and groups for a single file. You are able to do all of this from the current directory, using the “.” and “..” to tell Linux that you want to work in the current directory or the directory one up from where you are. You can also grant ownership to all files and subfolders with the -R, (recursive) argument. The above command just granted read, write and execute to the owner and the group, and read to others. The second command changed ownership of everything in the current folder, (.) and files in subfolders to jsmith2. As you can see, there’s a lot more to permissions than meets the eye. Learning how to change permissions, either by alpha or numeric mode is enough, but make sure you understand the permissions and how they translate in whichever mode you’re going to use. A secure database system is essential down to the operating system level, so as a DBA your understanding of how Linux does this allow you to secure your Linux host for SQL Server and help everyone sleep at night. The next article will start working with navigation and processes in Linux. There’s a lot to come and, hopefully, you’re able to work through these scenarios on your Docker image. Kellyn Pot’Vin-Gorman is a Technical Solutions Professional in Power BI and AI for Microsoft with a long history in multi-platform technology. A recent Idera ACE in the Microsoft community and an Oracle ACE Director alumnus, she has been awarded numerous awards over the years for her technical contributions and community volunteerism. She is one of only six women part of the Oak Table, a network for the Oracle scientist. 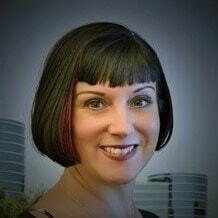 She has extensive experience in environment optimization, automation and architect of robust environments. Specializing in multi-terabyte management of OLAP/DSS systems. A consistent advocate for logical tuning of code and design before hardware solutions. She's recently become known for her expertise in DevOps, Enterprise Manager, AWR, (Automatic Workload Repository) Warehouse and virtualization of database environments with complex cloud management. The technical knowledge required to support these features offers great educational opportunities to learn by attending her technical presentations, engaging with her on social media presence as DBAKevlar or reading her blog, dbakevlar.com. Hey, that’s a fine intro to chmod. Thanks for sharing it. I do have two points, just about the variety of Linux distributions and setup. One is that apt-get (or now apt) is only one option for package management. If it doesn’t work, the reader will have to discover what their distro uses. The other is that DBAs will probably not get to run as root in the enterprise, and will have to investigate whatever their environment uses for impersonation.